Another recent visit to an artist’s studio was to meet and chat to local artist Liz Dulley. I have known Liz for some years and although not born in the Tayside area she has lived here since she was a teenager. Liz always enjoyed being creative but when she left school took a different career path. However a Fine Art course at Dundee F.E. College set her on the path to the many exhibitions, both selected and solo, commissions and awards she has received to date. Liz teaches watercolour classes in various venues across the area, and this year had work selected, and exhibited, for the prestigious International Group in ‘Fabriano in Acquarello 2018’ in Italy and the ‘Artists of the Year 2018’ exhibition at The Mall Galleries in London. She enjoys giving talks to various Art Societies about her ‘Inspired in Japan’ series of paintings so I was interested to hear more about her painting practice. Liz, I know you have always been interested in art but you only started painting seriously after you went to Dundee College. Would you encourage anyone who has an interest to follow the dream? What were the main things you took away from your time at Dundee College? I took away ‘Search for the essence! Explore! and Create something unique!’ I learnt to look in a different way, not just to draw but to create, use a sketchbook and develop ideas. I found this interesting and exciting and use this approach in my studio today. I had tutors, Jean Martin, Angus McEwan, David Martin, Jackie Cartwright and Ian Ritchie who were honest and encouraging which really helped me. When it wasn’t going so well I remember Jean saying ‘ Never give up Liz, there’s always a way to make it work ‘ and that became my challenge because a painting has got to work. Your recent work is inspired by Japan and I know you have visited the country, but what came first, the interest in the country or the art and techniques? Initially my interest in Japan was from my husband who had worked out there for a while. After listening to his stories I became interested in the country and eager to explore myself. I am draw towards culture from countries I visit. I studied the gardens, the architecture, symbols, tales and beliefs. I became fascinated by the people of Japan which led me to their art of nature and techniques. 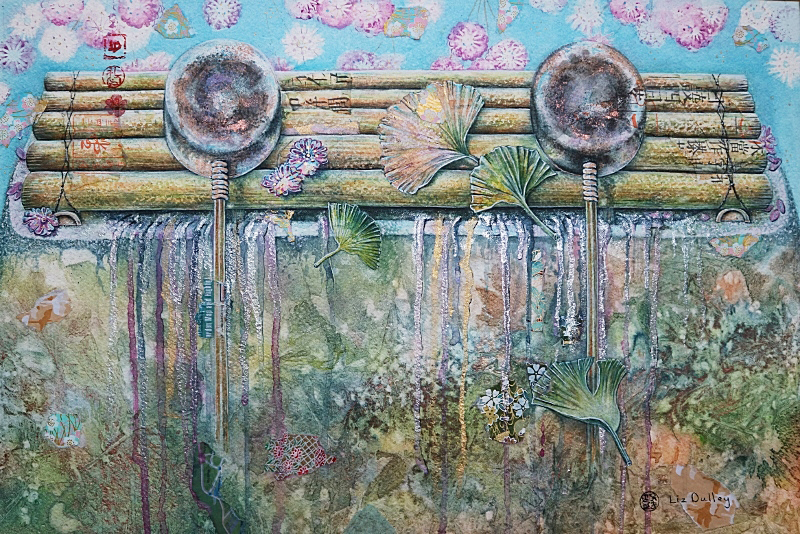 You are well known for the watercolour paintings you produce – does watercolour remain your favourite medium or do you employ a variety of materials and techniques? 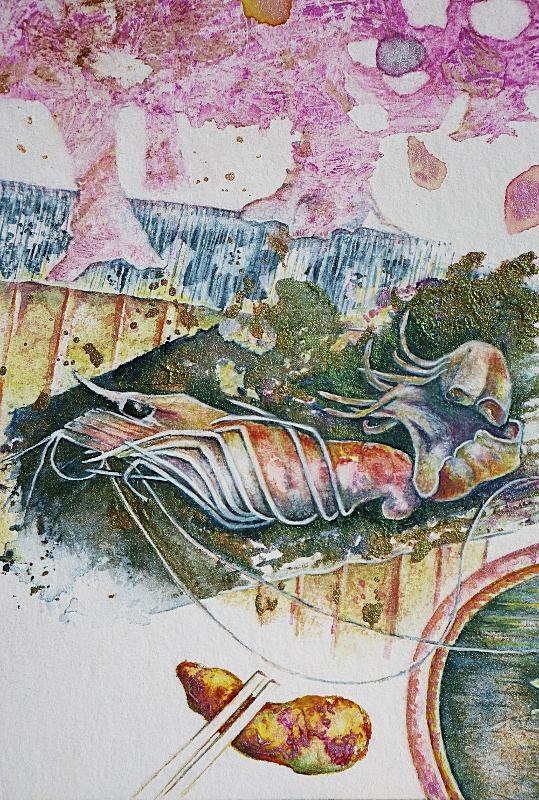 Watercolour is so versatile that I do not think I will ever tire of exploring it’s endless possibilities . . . and I really enjoy passing on these techniques at ‘Wonders of Watercolours’ classes at www.forganartscentre.com It’s exciting! I paint with watercolour in my studio and plein air when weather permits. Recent developments include the addition of paper fragments to the painting surface. However, I do like drawing, using charcoal and other materials. I’ve completed some commission work for Derwent so continue to experiment with their drawing products and have found the opportunity to employ skills with other media whilst teaching at ‘The James Hutton Institute’. You often use paper from Japan, what is so special about the paper you can source from Japan? It’s just that Sheila! it’s from Japan. I use only papers brought back from Japan with the view that I am adding a fragment of my visit to the painting. Each piece was carefully selected, from thousands of varieties. The experience alone of choosing paper was amazing and each hand picked sheet has become of value to me. I also experienced traditional paper making techniques so understand what goes into it. Consequently I use these papers with great consideration. It’s quite funny really and a long standing joke that when I was given gifts from Japan I liked the paper it was wrapped in more than the gift inside! Little did I know that I would be lucky enough to end up painting using such delights. You have exhibited widely around Scotland but you regularly have exhibitions here, in Dundee at the Botanic Gardens Gallery. How important is it for you to exhibit regularly? It’s been a great experience exhibiting with the RSW in Edinburgh, Glasgow, Ayr and Forfar, with the RGI, as an artist member of PAI and recently in Italy. To move forward on my painting journey and maintain the flow of ideas I find it essential to have goals to work towards. Exhibitions are a big part of this process. I enjoy painting in the gallery during my solo exhibition each year at Dundee Botanic Gardens. It’s of great value to get feedback, interact with the public and let them be part of it. I’ve had Japanese visitors. People come to share their experiences of Japan and ones who join in with visitors participation activities. It has become important for me to include my audience in exhibitions. People create an energy within me that I gather and utilise later when I’m painting. Regular exhibitions mean more deadlines resulting in more energy. Any exciting exhibiting plans or trips to Japan in the offing? I’m very excited to have started preparing for my next solo show ‘ Journey in Japan ‘ from 2nd – 16th June 2019 at Dundee Botanic Gardens. I have some beautiful kimonos and sketches that I am really looking forward to incorporating in my work. A trip to Japan is on the cards for next autumn. I think it will be different from our summer and spring visits. Colour will be my main reason for visiting. It’s also convenient for our Japanese friends. Although we only spend a few days with them they are an inspiration, invaluable guides, a source of local stories, tradition and information. Thank you, I’ll look forward to seeing the work you produce after your next trip to the Far East and to the exhibition next year. I’m sure as a source of creative inspiration, Japan has endless possibilities for future work for many years. 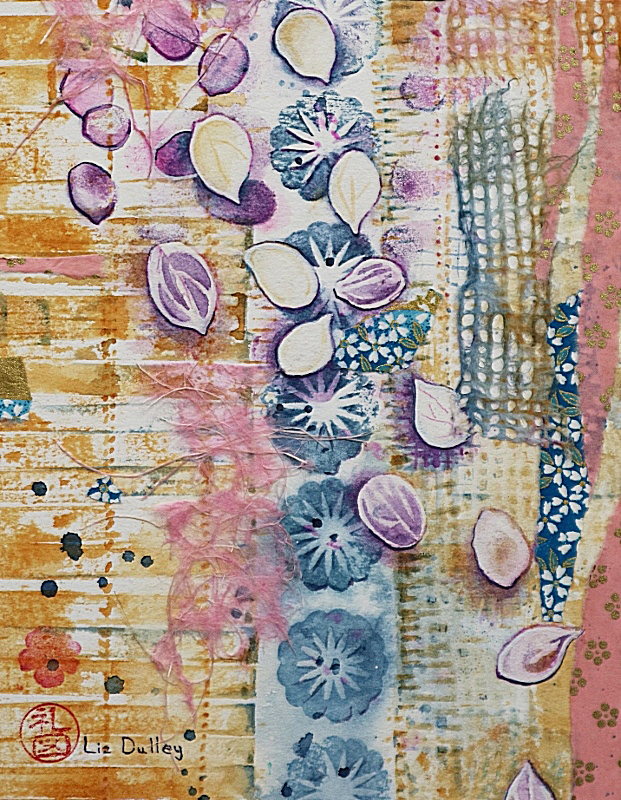 Your paintings and other pieces are so vibrant and I like how you sometimes add small pieces of collaged Japanese papers to the surface of some of the paintings which add beautiful patterned areas. So thank you very much, Liz, for taking the time to speak with me and allowing me to see some of your recent paintings. If you would be interested to see some more of Liz’s work, please have a look at Liz’s website from the link here to Liz’s website and at the link above. 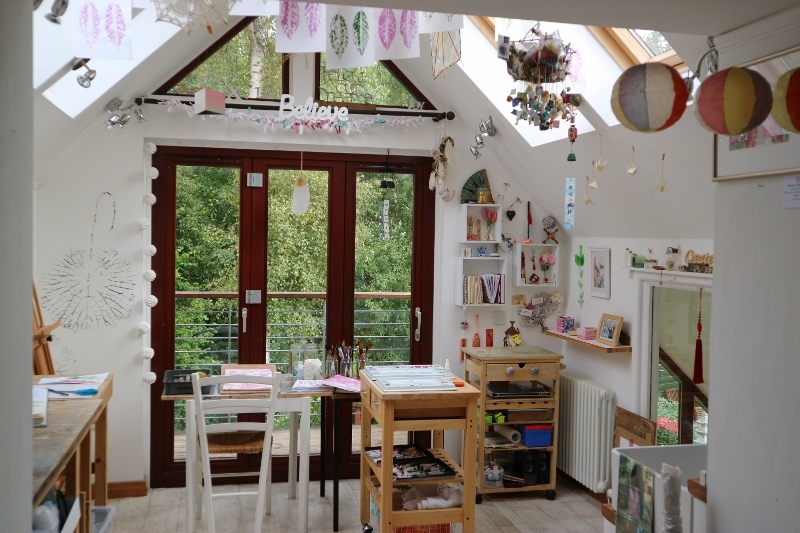 Every year as well as her solo and group exhibitions, Liz opens her studio in Perth Open Studios which is a lovely opportunity to see her working space and look out on to the Japan-inspired garden she and her husband have created. Well done Liz! Lovely to learn how it all came about as you and your work are so vibrant. Really loved the beautiful sketchbook image at the top. Thank you Morag. It was really quite exciting chatting to Sheila over how my creative came about. 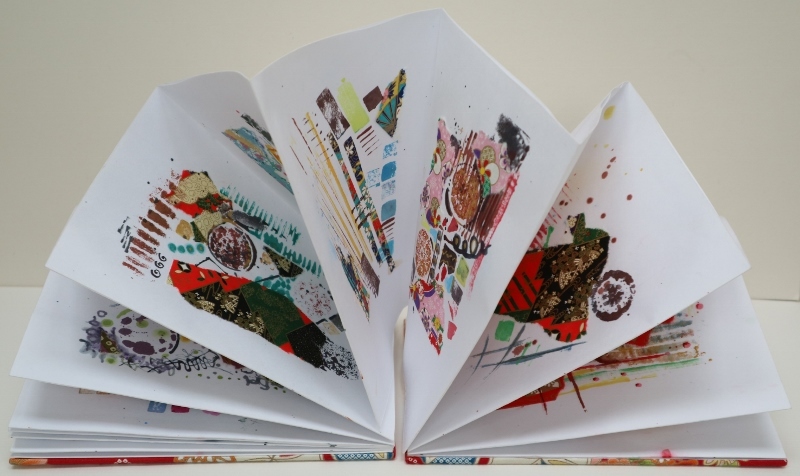 Nice to hear you enjoyed and pleased you like my little sketchbook. Thanks.